Welcome to TMG: Destiny 2 Our Review! It's almost the most wonderful time of the year, and the games that we have been looking forward to all year long are finally being released! One of my must haves is the new Destiny 2. Personally, I loved the first in the series and was waiting with baited breath for the much anticipated second in the line. Whether you are new to the series or a previous fan you won’t be disappointed because it…is…AWESOME! First the Graphics. Holy cow. My breathe was literally taken away when in the beginning of the campaign you are climbing a mountain, it breaks away to a awe inspiring sky shot. The sun shines with its rays dancing off various surfaces of the landscape. A ship glides across the screen amongst playful clouds and a breeze going through the trees down below. I literally just left it up on the screen to admire before moving on. Every bit of the game is like a moving piece of art. During gameplay, wisp of grass blow in the breeze, drips of water drip and drop, and the explosives and battle play give fourth of July a run for its money. I am in love! Add a beautiful soundtrack that changes fits fluidly with any scene and you cannot get any better in my humble yet correct opinion. complete- however that was because I was competing with X for screen time- so I believe 8-10 hours would be the consensus of how long it is to beat. Everything you do will help you level up to beat the boss at the end as well as give you a great start to all the side missions and online team play. Experience points as well as mix and matching gear and weapons help you upgrade easily and with ease although as in every game the more you play the harder it gets! I wish they had explained how exactly the upgrade and infusion system worked but honestly after a few hours in I had a pretty good grasp on figuring out the formula to maximizing my upgrading. 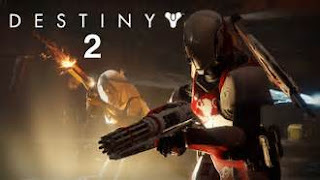 The three-character classes all brought different experiences and gameplay (duh) The Titan is perfect for group play because of his high damage points and less damage intake but also because of its shielding ability being able to take some of the brutal hits out of play when you are on a mission. Personally I found the Titan wanting in regular gameplay- although my friends did NOT and called me crazy- he is the strongest physically but I found him slow and was fonder of the Hunter. The hunter is skill based and swift and you really need to know how to utilize their moves to survive even the easiest of battles but I liked the way she swiftly went about her business and her melee special move. While the Hunter is still import to the team play, in terms of speed and retriving items that are in the distance in the end it is a self-sufficient character who only brings its quickness to the team basically I am saying you are gonna die a lot in co-op mode. X is in love with the Warlock and honestly that is probably the best character to start the series off with from the trio, with a powerful special move that blows everyone away literally and easy to use moves that let you get off to a good first start. For group play their area of effect rift circle is essential for successful missions. The Warlock can plant the erc on the battlefield which will either empower your teammates or heal which is a HUGE help during battles. The three classes work together wonderfully on team campaigns each complimenting each other’s weaknesses and forming a kind of perfect circle when used to their full capabilities. My favorite feature of the game is the fact that you are always online. Even when you are doing your own thang (yea I am too old to write that word that way, but it is done) you can go in and out of public events, starting your own and calling other players to arms, or going seamlessly to joint missions. The lag time is minimal which is great because my worst enemy are load screens- HATE them. The online aspect also means that when you end your campaign the game does not end there. There are tons of missions that I haven't even completed yet that lead you to different areas on all the worlds that you would not have gone to during the story mode. Add to it the weekly missions that are updated there is an endless supply of reasons to keep playing making this a game with high replay value. Special thanks to Activision for providing me with this game for review and making me a super happy gamer mom that can now avoid doing work and play Destiny 2 instead!